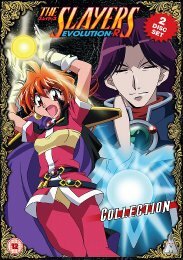 The magical mayhem of The Slayers Revolution continues in The Slayers Evolution-R! With the original cast of The Slayers back together for the first time in over a decade, Lina Inverse and her crew are reunited and doing what they do best - saving the world by almost destroying it! Lina's gang and their new ally Pokota are hot on the trail of the Hellmaster's Jar! It's no ordinary piece of pottery: it holds the soul of Rezo the Red Priest. Opening the vessel and resurrecting Rezo is the only hope Pokota has of saving his kingdom's people. With masked assassins, headless knights, and shifty Xellos in the mix, one thing is certain: destruction is guaranteed!